Recently I found the need to be able to use a Weblog client to connect to the sites and post content. There are several clients available to handle this task for Linux, MacOSX and Windows. As a matter of fact this post was created using GScribble (Linux). Installing the Weblog Client and trying to connect immediately will not work. You have to enable “Enable the WordPress, Movable Type, MetaWeblog and Blogger XML-RPC publishing protocols.” in your WordPress Dashboard. Login to the WordPress Dashboard for your Blog and click Settings -> writing and check “Enable the WordPress, Movable Type, MetaWeblog and Blogger XML-RPC publishing protocols.” Click Save Settings and you are ready to receive posts. Now you are ready to install a Weblog Client. 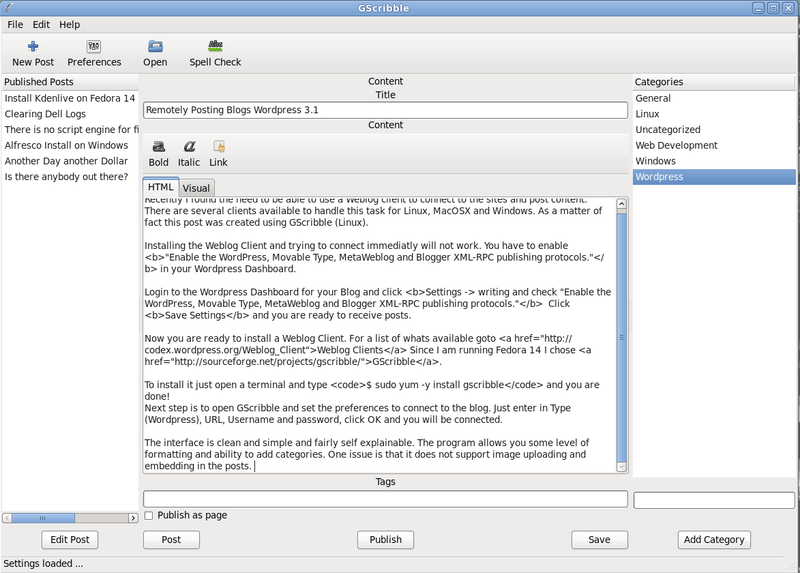 For a list of whats available goto Weblog Clients Since I am running Fedora 14 I chose GScribble. To install it just open a terminal and type $ sudo yum -y install gscribble and you are done! 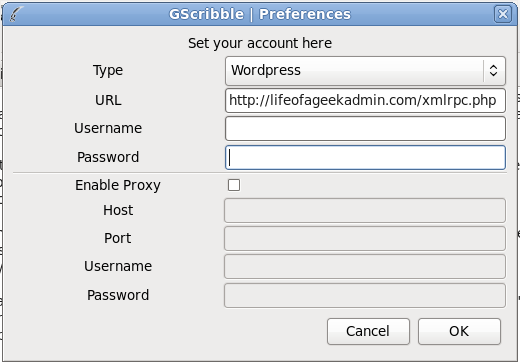 Next step is to open GScribble and set the preferences to connect to the blog. Just enter in Type (WordPress), URL, Username and password, click OK and you will be connected. The interface is clean and simple and fairly self explainable. The program allows you some level of formatting and ability to add categories. One issue is that it does not support image uploading and embedding in the posts. That’s all for this quick post. Look for future posts on Windows Clients and more advanced information on Weblog clients and WordPress.